Manage your group and click on the "Members" tab (in the manage toolbar). Search the members you wish to be notified when a new event needs to be approved and assign them a tag (e.g. Advisor Approval, Event Approvals, Approval Team, etc). Click on "Edit tags" and assign the tag. 3. 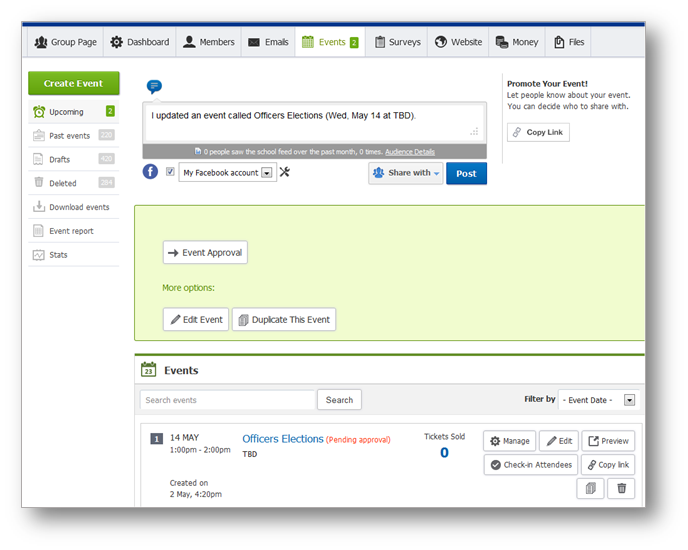 Create the Event Approval Form that students will have to complete upon each new event creation. To do so, in your Admin Group click on the "Surveys" tab, then hit the "Create survey" button and customize it as needed. 4. Click on the "Setting" button of the survey. Under the "Notifications" tab, select the tag created in step 2 in the "Upon submission, send notifications to members tagged with" field. 5. Once completed, please email us the name of the survey. Our staff will confirm once they receive it and have everything set up on our end. It should be pretty quick. Below is a screenshot of the form students will be prompted to answer once set up. For further explanation, please feel free to reach out to our Support Team.